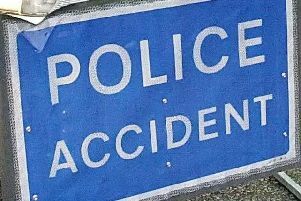 A man has died and a woman was airlifted to hospital following a crash between a car and a motorbike at Leasingham last night. Emergency services were called to Leasingham bypass just before 7pm on Thursday 5th July where a green Kawasaki motor cycle had been in collision with a silver Vauxhall Vectra. Sadly, the rider, a man in his 50s from the Lincoln area, was pronounced dead at the scene. His female passenger was airlifted to Queen's Medical Centre in Nottingham with serious injuries. The road was re-opened at about 2.15am this morning. Anyone who was in the area and saw either the green Kawasaki motor cycle or the silver Vauxhall Vectra before the collision or saw the collision itself is asked to contact 101 and leave details.